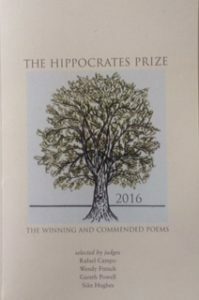 In April I attended the 7th International Symposium on Poetry and Medicine where the 2016 Hippocrates Awards were announced. A fascinating day, the programme included critiques on Philip Larkin’s The Building, Celia de Freine Blood Debts, Mary Kennan Herbert’s Skin Man series, as well as a presentation on Poetry, Psychoanalysis and Ageing, and a discussion around the evidence for the benefits of poetry for patients. Poetry readings of course dominated the proceedings, not just from winning and commended poets, but also sessions from Rafael Campo and Wendy French. A day truly rich in poetry, it left much to reflect on in terms of the potential for the genre to impact on the illness experience. Winners for the three categories within the Hippocrates Awards are featured below. These and many other poems selected by the judges are available in the 2016 anthology. Poems very gratefully reproduced by permission of the poets and the Hippocrates Prize. amid the maze of vessels. to snowstorm on my screen. secure in her certainty of drug and dose. escorting mother and the nurse. on a great lawn, a run-away pair braid ribbons of bridal white. What will I tell my colleagues, gathering in a nearby auditorium? young doctors eager with learning, still saddened by the sick. between the distant buildings prying free, the sails opening with light. the black glass of the sky. Six pills spread out in line. for the empty taste of air. Copyright © 2016 the individual poets. More information, including readings and excerpts from winning and commended poets, can be found here.